According to the Alliance to Save Energy, school buildings are the third largest commercial building energy users, and nearly 30% of that energy is used inefficiently. * Optimizing energy use through upgraded energy solutions can help schools reduce energy costs, reduce maintenance requirements, improve productivity, and more. Read on for efficiency solutions for the education sector. 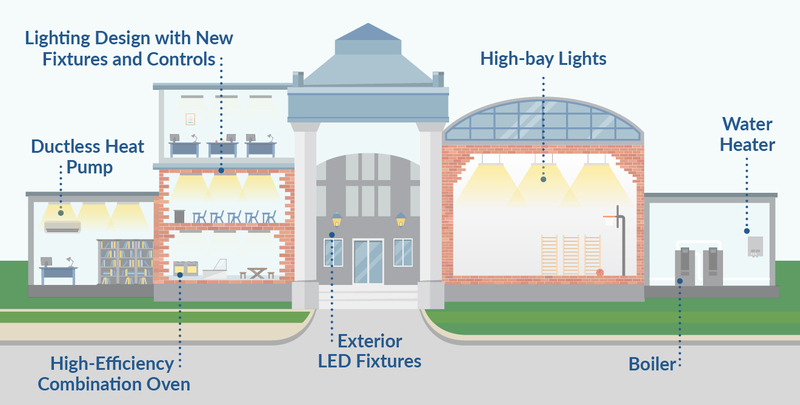 LED lighting solutions increase classroom productivity and improve comfort. High-efficiency cooking and refrigeration equipment reduces water usage, heat loss, and energy costs. Work with an Efficiency Maine Qualified Partner in order to be eligible for these incentives. Click here to find a Qualified Partner working near you. If you work with a contractor that is not yet a Qualified Partner, urge your contractor to find out more information here. Don’t see your energy solution listed above? Efficiency Maine offers incentives for custom energy solutions. Click here for more information on the Custom Program.